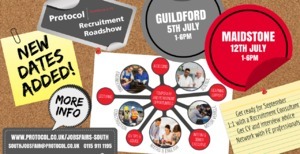 Protocol are holding a Recruitment Event in Guildford and we would love for you to come along and have a chat with us. We will be at Stoke Community Hall between 13.00 - 18.00. Please call Tess on 01159111195 to book your slot or email thazeldine@protocol.co.uk. Please see below further information on Protocol as a company. Protocol is the UK’s largest supplier of part-time and full-time staff to the Further Education sector. Protocol provide over 11,000 lecturers, assessors, internal verifiers and senior managers in Further Education colleges throughout England, Wales and Scotland. We provide Further Education colleges with flexibility for their staffing needs. At Protocol, professionalism and quality are our main priorities. We are continually developing our systems and knowledge of recruitment in the Further Education sector to ensure best practice in all we do.